Twilight Cider Works is making hard ciders from fruit grown at Green Bluff and around Washington. The cidery recently opened at 18102 N. Day Mount Spokane Road. The ciders are drier than most people expect, but have been well-received by customers and neighbors, said owner Will Jordan. Looking for Grapevine? The wine column returns on July 31 featuring Brian and Melody Padrta of Spokane’s Bridge Press Cellars. Hours: Noon-6 p.m., Saturdays and Sundays. New Traditions: An off-dry blend of five apples with a fruit and apples bouquet. It is best served with light meals and pairs well with chicken and pork dishes. Inland Empire: Named for one of the Eastern Washington’s best-loved apples, the Empire. The result is an off-dry cider with a sharp finish. Serve ice cold as an alternative to white wine. Pair with spicy foods or a cheese plate. First Harvest: This single variety cider is blended with juice from cherries harvested from a Green Bluff tree that is more than 100 years old. The white-flesh cherries offer just a hint of flavor to the dry cider. The biggest misconception that Will Jordan finds among those who are trying his hard cider for the first time is that they expect it to be as sweet as apple juice. Twilight Cider Works is among the growing segment of artisan hard cider makers that ferment apple ciders until almost all of the natural sugars from the juice are gone, leaving a subtly flavored and effervescent cider for bottling. Jordan and his wife, Jackie, started Twilight Cider Works about a year and a half ago. Jackie Jordan is the daughter of Rick Roening and their family owns Roenings on Green Bluff. When the Jordans moved to Green Bluff a few years ago to help with the family orchard, Will Jordan said he began thinking about making hard ciders as a nod to the apple growing history of the area. Twilight Cider Works, 18102 N. Day Mount Spokane Road, is in the sprawling former apple processing and packing plant used by Green Bluff growers until the 1990s. It opened in early June. Will Jordan said his father-in-law purchased the red barn complex after the packing plant closed. Jordan is a sleep technician for Deaconess Hospital, where his wife works as a respiratory therapist. They both work their day jobs, help with the family orchard and have been working on the cidery on the side. It’s been a busy year, Jordan said. After making ciders at home for a few years, Jordan attended cider making and appreciation classes at the Washington State University research station in Mt. Vernon to hone his skills. They bought 14,000 pounds of apples from Green Bluff and other Washington orchards in the fall and spent 10 days pressing fruit, using a tiny apple press that came with the building. Once the juice is in the primary fermentation tank, cider making is a lot like winemaking, Jordan said. Then, Jordan blended the resulting hard ciders and bottled them for the three initial offerings. The ciders are also pasteurized in the bottle. They made about 1,000 bottles of cider this year and plan to make more if there’s enough customer demand. 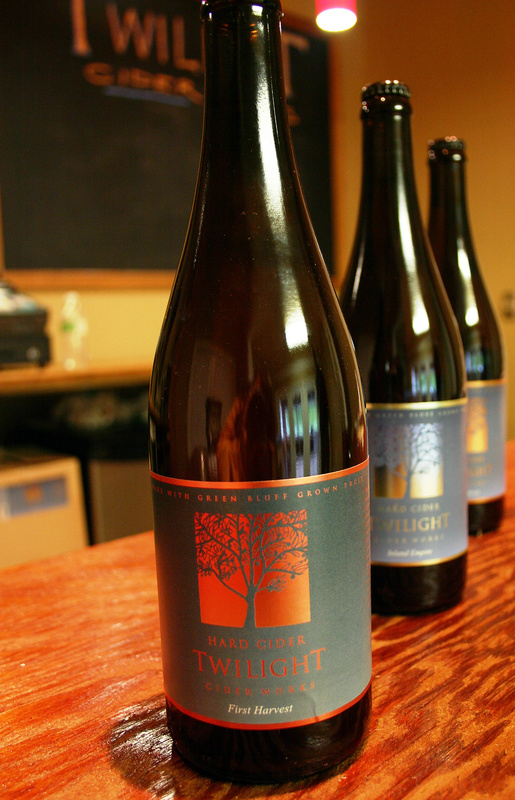 Twilight Cider Works has a dry cider and two off-dry ciders for sale. A dry cider means that there are almost no residual sugars in the finished product. Off-dry is a description that means there is a bit of sugar left to flavor the cider after fermentation. All of the ciders are slightly effervescent and have an alcohol content of less than 7 percent. The New Traditions is a blend of five apples that Jordan says is best served with light summer meals. He named the Inland Empire cider because it is made with Empire apples. The resulting cider is off-dry with a sharpness that works well with spicy dishes, cheese plates and meals that might otherwise be paired with white wine. Jordan created the First Harvest blend when he mixed hard cider with an experimental cherry wine he made. He made the cherry wine from a mix of white-fleshed Royal Ann cherries grown on a 100-year-old tree in the family orchard, along with some pie cherries. Alone, the wine was too sweet, but blended with the cider it gives it a subtle cherry nose and a hint of cherry flavor on the tongue. It is considered a new American style of cider making, because Jordan uses dessert and culinary fruit rather than cider apples. Serious hard cider drinkers describe the flavors of the cider much the way oenophiles describe flavors in wine. “Apples that were traditionally used for cider making were heritage apples from England that were grown in America. They were called bitter sharps, they were bitter and they had a high tannin level and they were small, like crab apples. If you were to eat one it would taste horrible, like licking a door. They were specifically grown for cider,” Jordan said. Customers can taste the cider at the Twilight Cider Works tasting room. It is open noon to 6 p.m. on Saturdays and Sundays. They also sell the cider in 750 milliliter bottles – the size of a traditional wine bottle – for $12.99 each at the winery. Jordan also plans to eventually offer 500 milliliter bottles for retail sale in area stores.